Throughout the months of August through October Texas, Florida, and Puerto Rico felt the life-altering effects of devastating hurricanes. Hurricane Harvey, a category 3 hurricane swept through Texas and other areas August 25 – September 3, 2017, followed by Hurricane Irma who came down on Florida as a category 5 storm, and then on September 16, 2017 – October 3, 2017 Puerto Rico was destroyed and continues to suffer from Hurricane Maria another category 5 storm. Hurricane Harvey was the first major hurricane to make landfall in the United States since 2005, and Irma and Maria were respectively the fourth and fifth costliest hurricanes on record with over $100 billion of damage combined. The hurricane assistance provided by the law students was a school-wide effort with numerous groups and individual students stepping up. In total, there were more than six law school events held, over $3,000 raised, and over 100 items donated. The Public Interest Law Society (PILS) hosted a trivia night fundraiser, held a merchandise sale, and drove an eight-truck caravan of donated items to the Lone Star Legal Aid, an indigent legal services provider for all of East Texas. Through the caravan the students brought over a dozen PC’s and monitors, 15 large desks, 45 office chairs and numerous other small items. “We’re no strangers to struggling to cope with the effects of hurricanes, and Texas has aided us so much in the past. So, we wanted to give back as best we could. 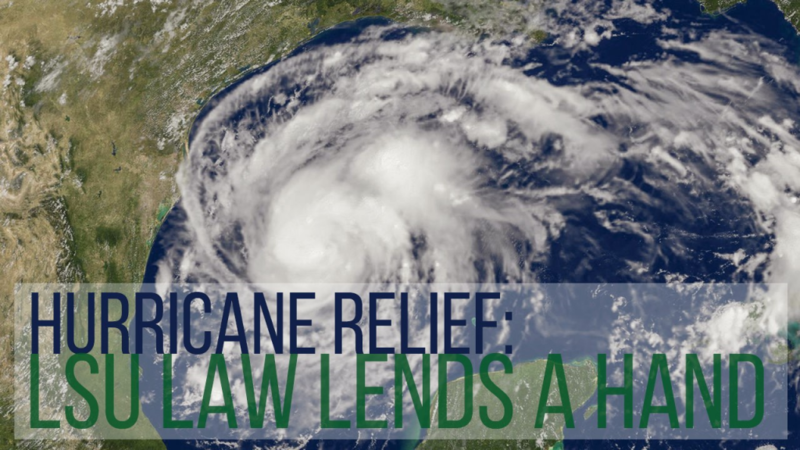 Additionally, we thought we could target our efforts by focusing on the legal community in Houston, specifically pro bono legal services providers,” stated the donation organizer MJ Hernandez, PILS Community Service Chair. Other student groups that got involved in the cause included the Christian Legal Society (CLS) which hosted a karaoke fundraiser with special guests Dean Carroll, and Professors Devlin, Thompson, and Brooks. Through the event CLS was able to raise over $370, including a fundraiser competition where each professor had a jar and the one with the most money had to get up on stage and sing. The Student Bar Association (SBA) also got in on the fundraising efforts hosting a “Deep in the Heart of Texas” fundraiser gif in conjunction with the LSU Vet School and selling over 100 fundraiser t-shirts, with all the proceeds going to the South Texas College of Law Student Relief Fund, a fund that lends direct assistance to students, faculty, and staff who were displaced by Hurricane Harvey. Another student group fundraising effort came from the Hispanic Law Students Association which held an Enchilada Plate Fundraiser on October 4, 2017, where students could purchase a homemade enchilada plate with all the money going towards the South Texas College of Law Student Relief Fund. The hurricane-aid effort was not solely a group one, Erin Abrams along with her roommates collected items to send to victims through the donation drive of Sudduth & Associates, LLC in Lake Charles. They were able to collect over five boxes of clothes, a few bags of towels, some sheets, blankets and bottled water. The fundraising efforts of the LSU Law students has not yet been completed, all the money raised at the Powderpuff Flag Football Auction on October 20, 2017 is going to the South Texas College of Law Student and the Black Law Student Association is currently planning a charity basketball tournament with all the money going to the victims of Hurricane Maria in Puerto Rico. Even with everything that has been done to help those affected by the hurricanes, there is still so much to do. One way to continue to help is through the National Voluntary Organizations Active in Disaster, more information about how can be found at nvoad.org.